To keep on the the secret code track we started with the cipher wheel free download, I thought I would write a little post on creating your own invisible ink. Lemon juice is the one we all learned about as kids, but really anything that is organic and clear (or nearly clear) can work. Milk and egg whites are examples of possible "inks." When using an organic material as your ink, the reader simply needs to heat the paper in order to reveal the message. The common manner is to use a match or lighter, but I find ironing the paper on low is the best way to read the entire message while reducing your fire risk. Baking soda also works with this heat method. All you need to do is mist one part baking soda to one part water as your "ink" and heat to reveal the message. Another way to read a baking soda message is to brush the paper with grape juice and the words will appear in a different color. Very odd indeed. Corn starch can also work when made into a mixture. This is a little bit of work, but interesting because the message can only be revealed with an iodine solution. Mix two tablespoons of cornstarch with 4 tsp water in a pan over medium hear. Boil until it is a smooth, thick consistency, almost like gravy. (Make sure not to burn it.) When ready, dip a toothpick or paintbrush into the corn starch mixture and write your message on a piece of paper. Allow the mixture to dry on the paper before folding it or attempting to read it with the iodine solution. To read the message, mix 1 part iodine to 10 parts water and brush the solution on the paper with a swab over the hidden message. The secret message will appear in purple. "Postal employees have been ordered to upsell pricey express or priority mail services to anyone sending anything more than a letter, according to an anonymous tipster. The directive comes straight from Washington to help combat the Post Office's $1.1 billion operating deficit. To avoid the upsell, specifically ask if there is a cheaper way to ship your package"
Read the entire post at the Consumerist, here. Of course, the "pricer" services have their advantages, but I figured I should point LWAers to this article so they can decide for themselves. Lovely envelope art from Carolee of Pod Post. Don't forget to submit your mail art for the Pod Post book, Good Mail Day! Crane Stationery is hosting a contest giving a lucky letter writer the chance to win $500 and stationery. 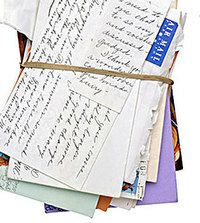 "To celebrate the tradition of letter writing, we welcome you to share a treasured letter that you've received and kept. One winner will be awarded a Crane stationery wardrobe for all of his or her correspondence needs, valued at $500. Crane will award $250 worth of Crane stationery to three runners up. Contest ends May 1st. The winner will also receive a copy of Crane’s Blue Book of Stationery as well as signed copies of books by our esteemed guest judges Letitia Baldrige and Samara O’Shea." With the months counting down until the 1¢ increase, let's have some fun with the stamps we have now. 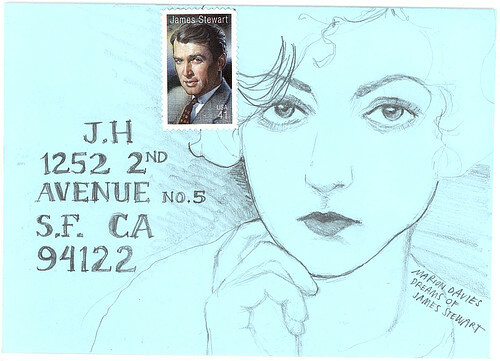 Jamie Wieck did a great job of incorporating stamps into the art of these postcards, but why not do the same for envelopes? Show us what you come up with! I always carry around a pen in my bag, but then, I'm a wee crazy. If you don't do that, make sure to always keep a writing instrument in your letter kit. I have a little Rolodex for my addresses, so I carry a little "cheat sheet" or pocket address book in my kit. Jill Bliss's pocket pal set is perfect for this, and what is super keen is that it comes with two, so you can give one to a friend or keep it for yourself in case you lose the first one. You can also use a simple index card and put the people you most commonly write to on there. Obviously, you need something to write the letter on. As foundation, you should have two sheets of normal stationery so you have something if you are in a rush to get out the door or just forgetful. You can always pop in some fancy stationery right before you leave. By default, I put some colored printer paper in my kit, that way I always have writing material even if I forget to put some "real" stationery in there. If you fold the paper in half you have a booklet-style writing paper, which is quite reminiscent of the golden age of writing. I love odd & bright envelopes and always keep these in my kit, but any old envelope will do, especially in a pinch. Try to keep your kit stocked with about four envelopes in at least two different sizes to accommodate all letter types. You're out, the letter is done and sealed in an envelope, why not put a stamp on it and mail it off right then and there? Easiest way to do it is when you buy a sheet of stamps, cut it in half - keep one half at home and tuck the other half into your on-the-go kit. You all know I have a thing with fountain pens. Just because I'm writing a letter in the bakery doesn't mean I should sacrifice my inky love. With that, I got myself an inexpensive, all purpose fountain pen, the Sailor Profit Super Script Fountain Pen. The nifty thing about this Sailor pen is that depending on how you angle the pen, you can get three different thicknesses of line (thin, medium and thick). This comes in handy when you are writing on different types of papers as certain pulps will absorb or react to fountain inks differently. The pen is also made out of plastic, so I don't have to worry about chipping or cracking it and it also has the option of using a converter so I can use well ink. If you pack a fountain pen, don't forget to bring your cartridge refills in case you run out of ink mid-letter. If you are more of a well ink person, there is a nifty, albeit expensive, option for you: the Visconti traveling ink pot. I don't have any experience with this item, but trumpetvine travels is quite fond of it. Doll up a letter with stickers, close an envelope with a neat seal (sticker or wax) - store-bought or home-made. Whatever your choosing. Decorative address labels are also a keen thing to keep in your kit. This may be a bit much for a kit, but it all depends on what you consider writing basics and how big your pouch is. You can keep a simple "top secret" hand stamp in there and get one of those sleek stamp kits that come in a tin, like the Cavallini stamp sets. • Make your own! A how-to from Blueprint. I hope this little list of materials will get you thinking of making your own letter-writing-on-the-go kit, or at least curious as to other writing goodies! Please email us photos of your kits or upload them on the LWA Flickr group - we love seeing your letter-writing paraphernalia prowess. Take some chopsticks from your kitchen drawer, along with $25 cash and a take-out Chinese food menu, seal them up in an envelope. Mail off the envelope to one of your currently unemployed friends, you college-aged kid brother or sister, or a person you know who is financially strapped at the moment. Keep it anonymous. 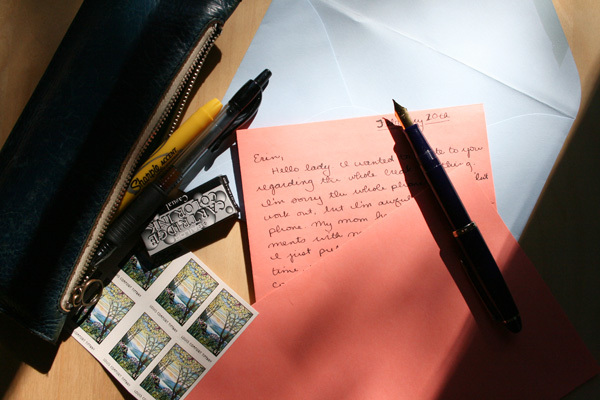 Do not hand-write the mailing address or enclose a note. Include the take-out Chinese food menu regardless of the person's geographic location; you want to be sure that the person you mail the envelope to gets the right message and orders up some good take-out. 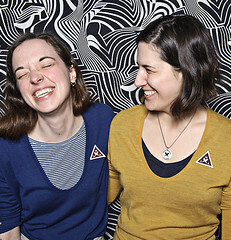 The book has oodles more projects that revolve around letters, snail mail and photography. I suggest you pick it up or check it out from your library. It will make great pen pal ammunition. I've been thinking a lot about penmanship lately. I've never thought of my handwriting as bad, but neither is it something to stare in awe at. Donovan, on the other hand, has great penmanship. I constantly ask her to write things for me. Between her and being impressed with the ink work on some of the vintage letters I own, I started looking about for old penmanship books. Ebay has plenty of school handwriting books from anywhere between 1880-1950 as well as 19th century penmanship books for young adults. I've lost several auctions already and have yet to get my hands on any of them, but I did find a website that has some nice pages showing the Spencerian Pemanship technique. Want more penmanship eye candy? 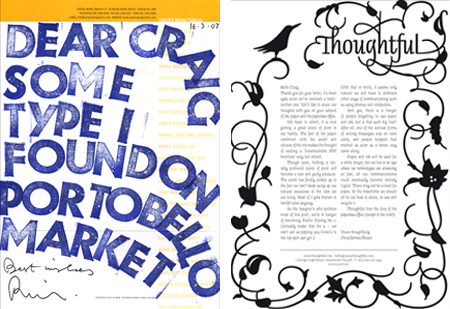 Betsy Dunlap has some great examples of her calligraphic hand lettering, some of which I uploaded onto my flickr. Bluebird Studio also has some great examples of her pen work that may inspire you. 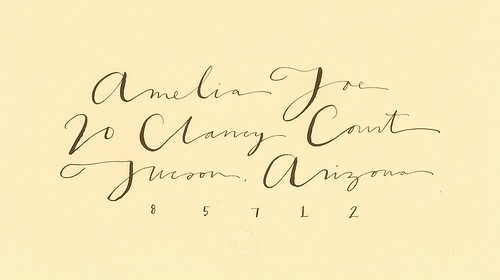 If you are interested in more lessons & history, check out this website about cursive handwriting. 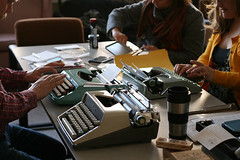 The photo Docmoreau uploaded on the LWA flickr group made me remember my super love for illustrated letters. If you are keen on this style of correspondence, check out the Smithsonian's online gallery, More Than Words. There is a little sampling of the illustrated letters they have in their archives and they even have links to hi-res scans of the letters. 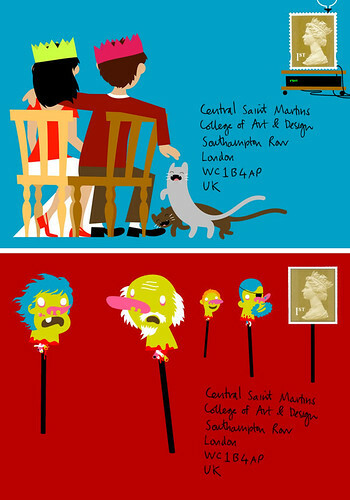 Also, I just discovered this project, Letter's lives. Very cool.